One of the subsequent days, we went to Hapuna Beach, which is a state park and has easy car access, showers, and even some vendors. The day wasn’t clear, but 78F is still 78F, and the water was still delightful. There was wind, which created some copy surf, but we still enjoyed the expansive beach. Later that night, we decided to take in a Luau; the preliminary activities were fun enough, but the actual show was kind of a turd. Michelle and my parents had all been to a Luau before and thought the food and show was lacking by comparison. I thought the food was just fine, but the “Freedom cost a buck ‘o five” God/Country Music/USA song was both so bad and out of place that my meal was in peril. I guess they know their audience though, because everyone else thought the jingoistic number fit right in with the “tour of Micronesia” theme. We then left shortly after Ella got scared by a Tongan warrior dancer who nearly collided with her and he weaved through the audience making menacing gestures. I can see how she might have been a little scared, but I thought it was amusing. We continued our tour of beaches with Kahalu’u Beach Park, where we rented a boogie board with a viewing glass so Ella could see fish. Despite swimming lessons from a young age and constant bath-taking, she’s surprisingly timid around water. 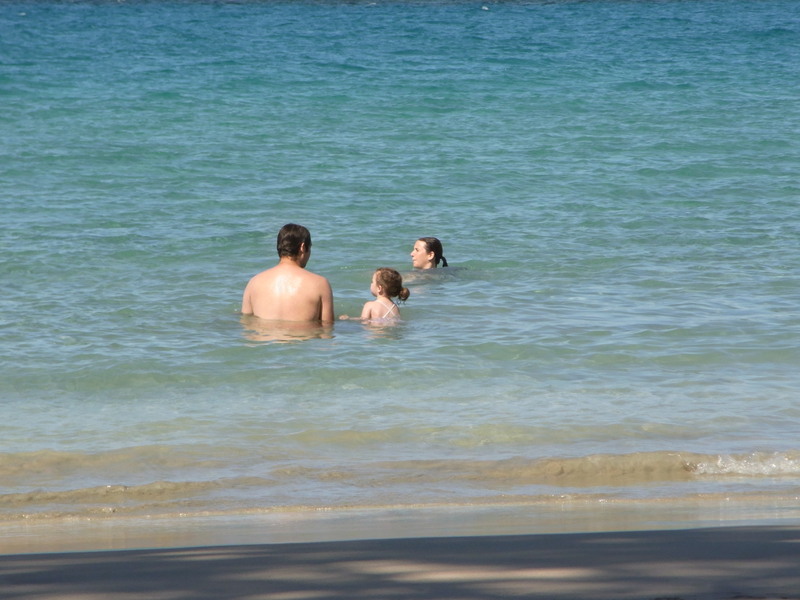 Still, she enjoyed the view, and Michelle and I were delighted to be in the warm ocean with our little girl. We almost collided with a turtle too, but my spastic response scared both the turtle and Ella, who was done being in the water. We moved north up the highway to the next beach which was very sandy and the surf was high. We did some body surfing, saw some dolphins, and played in the sand. I think my favorite beach (except Makalawena) was Mauna Kea Beach. It’s adjacent to a resort/golf club, but that doesn’t ruin the excellent view of the northern knob of the island, the delicious water, and trees overhanging the sand. We set up our blankets underneath a sort of locust tree and were shaded the entire time, which is good, because I think they take your infant away if you get it sunburned. 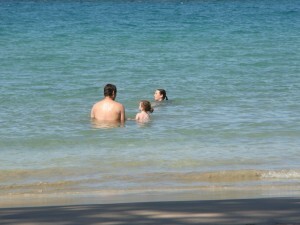 We played in the surf, both girls thoroughly enjoying the warm water and gentle waves. The snorkeling was actually quite good around the rock/reef on the south end of the beach. Plenty of sea life, reef, and no one got hit by an errant golf ball. My favorite snorkeling was actually at “Place of Refuge,” a rocky bay that is teeming with life, and where the sea floor dives to about 80 feet just off the shore. There’s a cool set of steps in the rocks (accidental, mind you) at the north end of the bay where you can drop in to the water. You’re immediately greeted by schools of yellow tangs, and if you follow the shore along the north end of the bay, there’s just too much to see. The coral is fascinating and hides so many little creatures which you don’t notice until you get close. Swim out towards the middle of the bay and you watch the coral drop quickly in to the beautiful blue abyss. I hurt my ears several times trying to really get down deep because the scale of the place misleads you about how big the place is. Plus, I wanted to try and reach the dive mustering spot with the word “ALOHA” spelled out in cinderblocks. My dad and I visited twice, the second time everyone else joined us. We also visited the National Park facility there at the place of refuge. But like all good things, the end came, and we boarded our respective flights home. Grandma and Grandpa took off on the Blue and White plane, and we boarded ours. The trip home still went really well, though it’s possible that the effort of keeping two children happy on a 6 hour flight erases at least some of the relaxation we’d escaped for. Madeline was awake for most of the flight home, and really didn’t care to be seated much. When we finally arrived in Seattle, everyone was hungry, and all the restaurants were closing or closed. After a sleepy flight back to Portland, we were home, and only had to stomach two days of work before the Thanksgiving holiday.